Many of us take for granted that we can move about freely on a daily basis. Jump in our cars, grab a bus, take a cab. But for the elderly, it’s not so easy. Failing eyesight makes it difficult to drive, especially at night. Unsteady legs are a challenge for getting on and off buses or waiting for a cab. Suddenly, the freedom to go places and do things dwindles or even disappears. The toll of quality of life can be devastating. No longer able to go shopping, visit with friends, socialize at church or the senior center, or go to the doctor’s office, the ability and even desire to function daily fades. The Community Transportation Association of America (CTAA) estimates there are 26 million elderly Americans dependent on others for their mobility. As baby boomers age, that number continues to grow. According to the CTAA, by 2030 the number of drivers over 85 will be four to five times greater than today. As Americans, we love our cars and it’s difficult for some to give them up. Because of this, unfortunately, the CTAA predicts the number of senior traffic fatalities will triple by 2030. Many seniors understand they should no longer drive but continue to do so because they are unaware of other travel options. Many do not want to burden their families or friends by asking for rides, yet, relying on others for rides (ridesharing) is a common alternative used by the elderly. Family members, caregivers, and friends should try to find simple ways to make their older passengers feel at ease about asking for rides. Deciding not to drive can certainly alter an older person’s daily routine and habits, but does not have to signal an end to independence. Seniors should be made aware of the options that exist in their communities since available alternatives may differ greatly depending on where they live. Does he or she live in a rural or urban community? Are there medical considerations that could affect mode of transportation? What tasks or events are requiring transportation? How frequently and how far? What economic resources are available? Medicaid will cover non-emergency medical transportation, such as scheduled doctor appointments. Medicare, however, will only cover emergency medical trips, such as those requiring 911 service. In certain chronic and debilitating cases, Medicare will pay for non-emergency trips, but these need to be worked out on a case by case basis. Other insurance companies have only recently begun to consider transportation as an insurable cost. Sometimes hidden opportunities can be found in plans, such as worker’s compensation, as a way to get coverage. The options vary greatly among insurance carriers and plans, so it’s best to consult with the insurance company in question to see what it provides for coverage. Seniors and their family members and caregivers should be aware that the Americans With Disabilities Act (ADA) guarantees a basic level of transportation service for many older citizens. The ADA states that a municipality providing a community public transportation service also must provide a complementary or paratransit service for persons with disabilities and many seniors will find themselves eligible for this system. Since the goal of the ADA is to guarantee disabled citizens the same rights as the general public, the paratransit system must be comparable to the regular public transportation system in response time as well as days and hours of service. 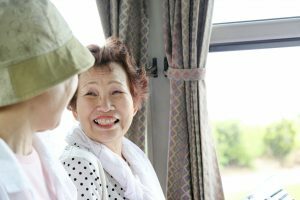 Public transportation is the most obvious choice for seniors in good health who decide they no longer want to risk driving. It is one of the least costly means of transportation (most single rides cost under $2.00) and can provide non-drivers with a relative sense of independence. Public transportation, however, does have limitations for seniors that might include walking to and from bus or train stops, adhering to schedules, waiting for buses outdoors in bad weather and climbing or descending flights of stairs. Paratransit service provides a more specialized and personalized level of service for people who cannot use the fixed route public transportation system. Paratransit vehicles usually include vans that are easily wheelchair and handicapped accessible. The paratransit service must extend to a three-quarter mile corridor on each side of the normal fixed route. Many paratransit systems provide curb-to-curb service to locations within their designated complementary routes. It is important to note that curbside service differs from door-to-door-service. Unlike door-to-door service, paratransit drivers will not enter people’s homes to assist them with getting to and from the vehicle. Paratransit users must be able to navigate their way onto the vehicle or have a personal care attendant (PCA) to help them. Another important law affecting senior transportation options is the Older Americans Act (OAA). The OAA allocates funds to Area Agencies on Aging. These agencies are invaluable resources for elderly individuals looking for alternative means of transportation. By law, Area Agencies on Aging are required to provide access to support systems such as nutritional services. Many times, the agencies will meet this requirement by providing transportation to seniors as a means of providing access to such services. In addition, the agencies must provide referrals for their elderly clients to other transportation agencies. The government allocates funds to the area agencies for use in matters benefiting elderly citizens and most agencies make transportation one of their priorities. Every state has one of these agencies. This entry was posted in Tips and tagged elderly transportation, paratransit, transportation for seniors. Bookmark the permalink. Comments are closed, but you can leave a trackback: Trackback URL.